The conventional leather tanning technology is highly polluting as it produces large amounts of organic and chemical pollutants. 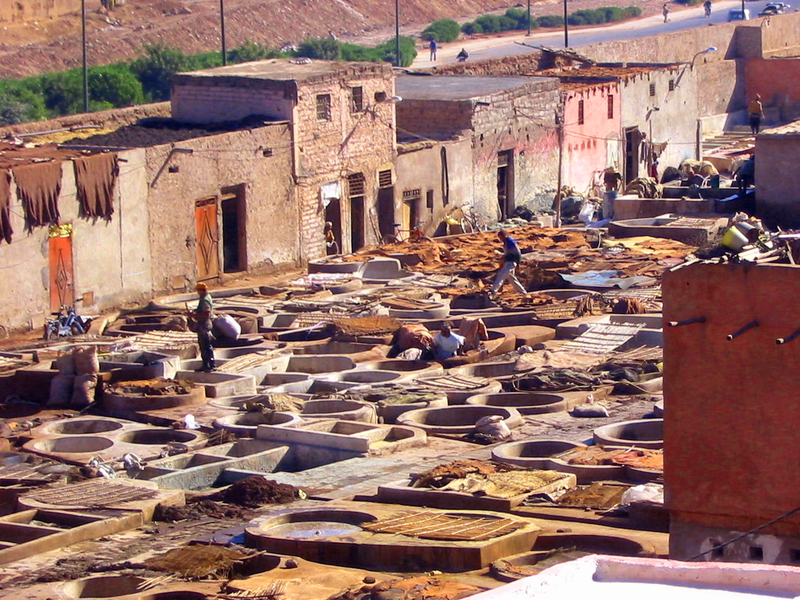 Wastes generated by tanneries pose a major challenge to the environment. Anaerobic digestion of tannery wastes is an attractive method to recover energy from tannery wastes. According to conservative estimates, more than 600,000 tons per year of solid waste are generated worldwide by leather industry and approximately 40–50% of the hides are lost to shavings and trimmings. Everyday a huge quantity of solid waste, including trimmings of finished leather, shaving dusts, hair, fleshing, trimming of raw hides and skins, are being produced from the industries. Chromium, sulphur, oils and noxious gas (methane, ammonia, and hydrogen sulphide) are the elements of liquid, gas and solid waste of tannery industries. Anaerobic digestion (or biomethanation) systems are mature and proven processes that have the potential to convert tannery wastes into energy efficiently, and achieve the goals of pollution prevention/reduction, elimination of uncontrolled methane emissions and odour, recovery of biomass energy potential as biogas, production of stabilized residue for use as low grade fertilizer. Anaerobic digestion of tannery wastes is an attractive method to recover energy from tannery wastes. This method degrades a substantial part of the organic matter contained in the sludge and tannery solid wastes, generating valuable biogas, contributing to alleviate the environmental problem, giving time to set-up more sustainable treatment and disposal routes. Digested solid waste is biologically stabilized and can be reused in agriculture. Until now, biogas generation from tannery wastewater was considered that the complexity of the waste water stream originating from tanneries in combination with the presence of chroming would result in the poisoning of the process in a high loaded anaerobic reactor. When the locally available industrial wastewater treatment plant is not provided by anaerobic digester, a large scale digestion can be planned in regions accommodating a big cluster of tanneries, if there is enough waste to make the facility economically attractive. In this circumstance, an anaerobic co-digestion plant based on sludge and tanneries may be a recommendable option, which reduces the quantity of landfilled waste and recovers its energy potential. It can also incorporate any other domestic, industrial or agricultural wastes. Chrome-free digested tannery sludge also has a definite value as a fertilizer based on its nutrient content. Biogas produced in anaerobic digesters consists of methane (50%–80%), carbon dioxide (20%–50%), and trace levels of other gases such as hydrogen, carbon monoxide, nitrogen, oxygen, and hydrogen sulfide. Biogas can be used for producing electricity and heat, as a natural gas substitute and also a transportation fuel. A combined heat and power plant (CHP) not only generates power but also produces heat for in-house requirements to maintain desired temperature level in the digester during cold season. A highly advanced wastewater treatment plant and biogas system became fully operational in 2012 at ECCO’s tannery in the Netherlands. A large percentage of the waste is piped directly into the wastewater plant to be converted into biogas. This biogas digester provides a source of renewable fuel and also helps to dispose of waste materials by converting waste from both the leather-making processes, and the wastewater treatment plant, into biogas. All excess organic material from the hides is also converted into biogas. This project enables ECCO Tannery to reduce waste and to substitute virtually all of its consumption of non-renewable natural gas with renewable biogas. The aim is to use more than 40% of the total tannery waste and replace up to 60% of the total natural gas consumption with biogas. Tagged Anaerobic digestion, Anaerobic Digestion of Tannery Wastes, Biogas, biogas from tannery wastes, CETP, CHP, Chrome recovery, leather industry wastes, sludge, tanneries, Tannery Sludge, tannery waste management, tannery wastewater, waste management in tanneries, waste to energy in tannery, Wastes. Bookmark the permalink. I agree that; “Chrome-free digested tannery sludge also has a definite value as a fertilizer based on its nutrient content.” However, I wonder what could be done to achieve profitable digestate sales/ use by normal methods if there remained chromium in the digestate. Surely that might put the cost of sludge dispoal up and ruin the economic case for Anaerobic Digestion? How tannery wast can be chrome free, while this is one of the basic component of tanning industry? What is the way to construct Anaerobic digester? Can you please suggest to any plan or video? Kindly advice. There is no waste, consider it materials to be renewed, a process providing energy, water and new materials. Make it the start of a process, not the closing step. Surely it will cover more than just the local leather industry. In Holland a leather processing plant has started up a facility to turn the hairs into proteïns, waste to food(supplement) as it is.